We’re in for an early morning safety briefing. This is your boat. These are the pedals you will use to steer your boat. Wait, what? Push the top half of the pedal with your foot. Left to go left, right to go right. Simple. I’m used to having a rudder on a canoe to help it go in a straight line, not for steering! I know how to steer with a paddle, not with my feet. Please demonstrate to me you understand how to get back into your boat if you fall out on dry land with no waves rocking you, no currents pulling you. Good. We load up three boats. Two doubles and a single. Lisa has paired up with Dad, Jason with Mum and I’m on my own. The partnerships are agreed on with everyone’s best interests in mind. Lisa and I won’t fight. Mum and Dad won’t fight. 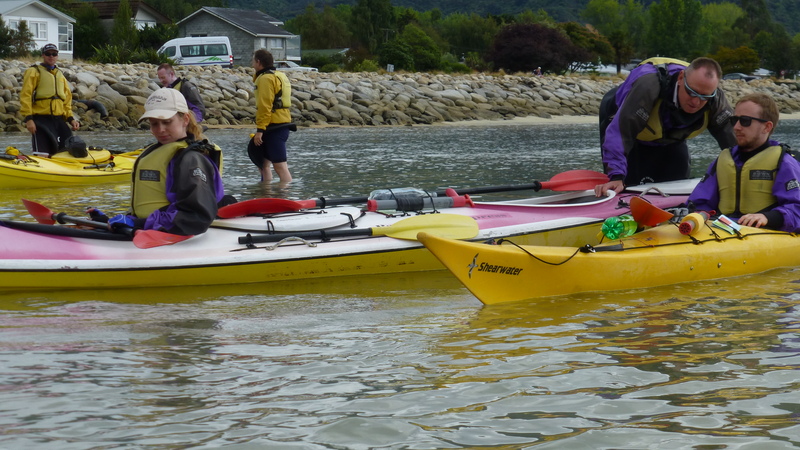 Camping gear, cooking equipment and food goes in to the storage compartments on each kayak. It’s been many years since I first and last undertook a semi-serious expedition, the additional weight is going to make things interesting. The first time I remember going in a canoe we went straight on the water. Lesson number one, how to safely capsize. Lesson number two, how to get back in when you’re cold, wet and in a mild state of shock. Once we’re in the water, there’s no requirement to roll, presumably for the benefit of our tents, sleeping bags and clothes. You don’t want to get the kit wet if you can help it. A land based practise is apparently enough to show we’re not idiots and should survive the trip if anything were to go wrong. We showed we can move the boat forward and backwards and turn from left to right, a little spin on the spot and we were free to leave. Thick clouds, a little drizzle. Hardly a beautiful day, the good news is there’s little risk of sunburn. We’d barely left the shore before we each agreed that it was going to be too hot and stripped out of our weather proof jackets. Once we were back on our way, it didn’t take long for me to fall behind. 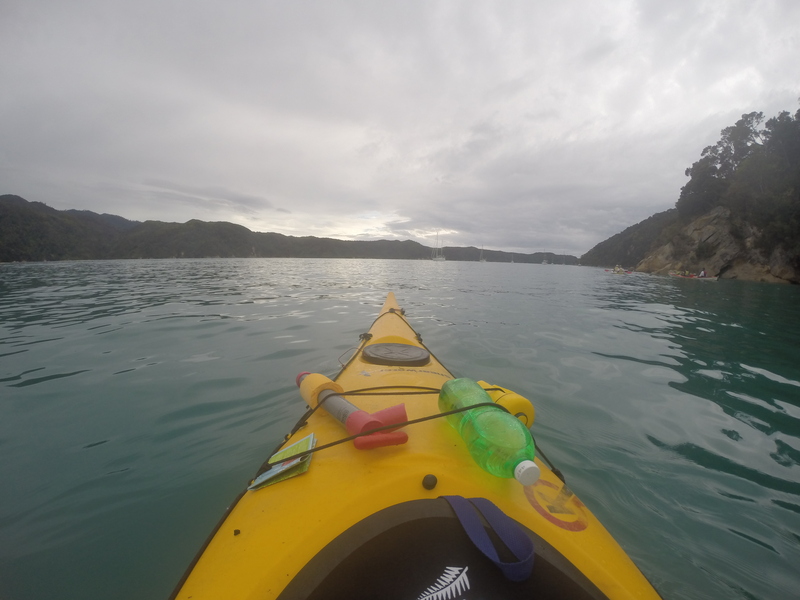 I was finding steering difficult, I kept leaning with my paddle, rocking precariously close to the water. I couldn’t find the sweet spot with my feet. It was like learning to brush your teeth with your less dominant hand. It doesn’t make any sense. It felt all wrong. I had less power as well, I was doing all of the work to get my boat to move along at a good speed. The others regularly slowed to a stop while I caught up. It’s a serious workout for my underused upper body. 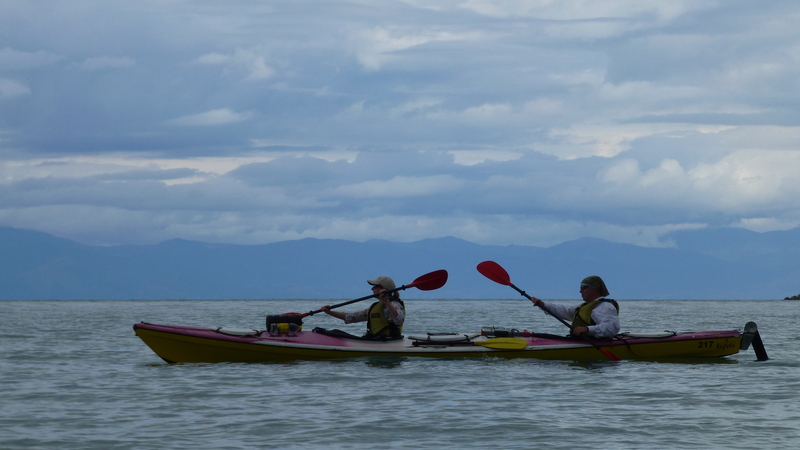 We paddled out to Adele Island where we’d seen the seal colony from the water-taxi. 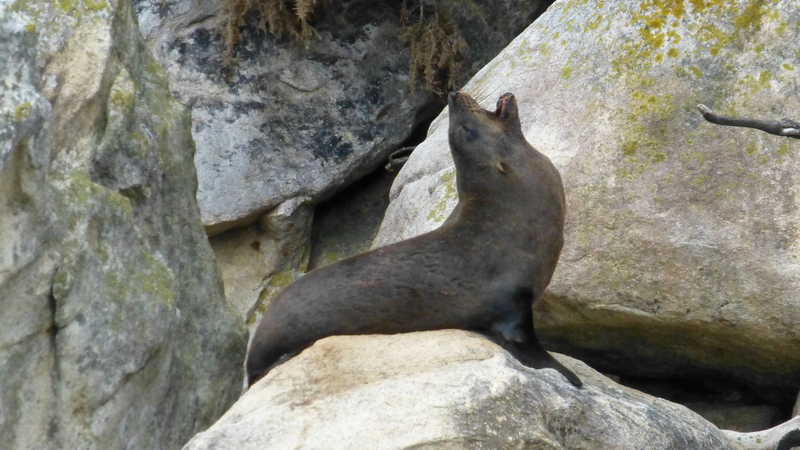 There were mothers with young pups all around the rock bottomed cliffs. When you’re at their level watching seals are a lot of fun. We’d been warned that some of the adolescent seals might get on the front of our boats and expect a free-ride up the coast. I was equal parts excited and terrified by this prospect. Seals look like small bears, bears with a fish tail. They are surprisingly agile on the uneven surfaces of the boulders they rested on, there’s a lot more strength and control in those tails than I’d previously considered. 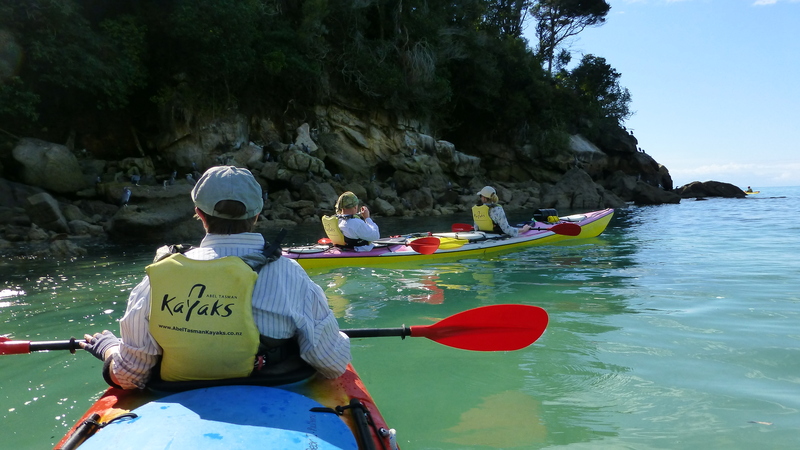 I wasn’t mad keen on the idea of one jumping up on the front of my small kayak. 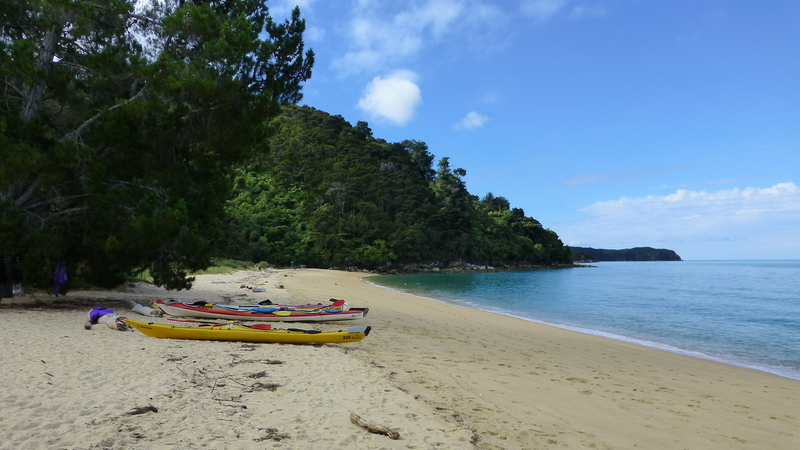 We paddled back towards the mainland, towards one of those golden sandy beaches inaccessible from the coastal track, it looked a lot more like the promised land from the guidebook. The green sea in just beneath my hands. It’s a constantly changing pane of glass, bobbled like a bathroom window, rippled like a decorative vase, a calm mirror reflecting the world above. I can reach out and run them over the smooth, cold surface. It’s refreshing. I recently described myself as a water enthusiast, being in it, on it or just near it. I’m a fan of walking too, as you can probably tell. Being outside, taking pleasure in my surroundings, I appreciate the time to think, the meditative aspects that come with being alone in the wild. These are all good things but when I compare it to floating in a plastic shell, it doesn’t come slightly close. Everything was better from this perspective. I felt more aware, more relaxed, almost as if I was at home. We beached on soft white and yellow sands. Shallow waves make an exit only slightly challenging as the boat gently rocks. Getting out of a boat dry has always been the hardest part for me. 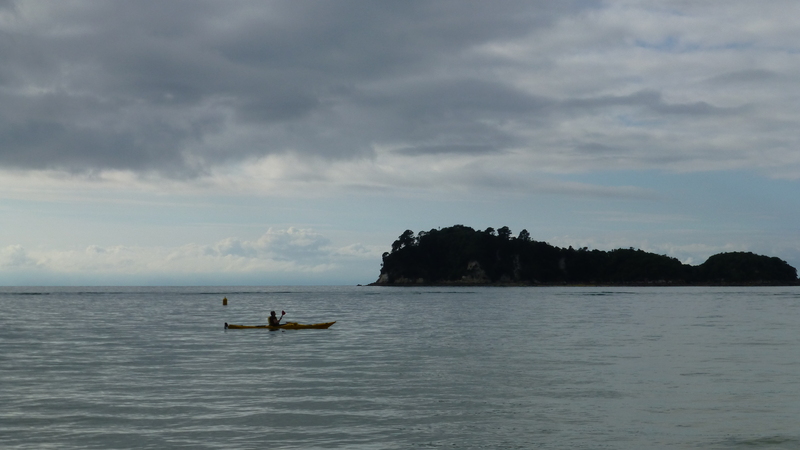 We paddled towards Apple Tree Bay which we’ve agreed looks a good spot to spend the night camped out on the beach. We arrived in the early afternoon, nobody else was there so we had the pick of the beach. 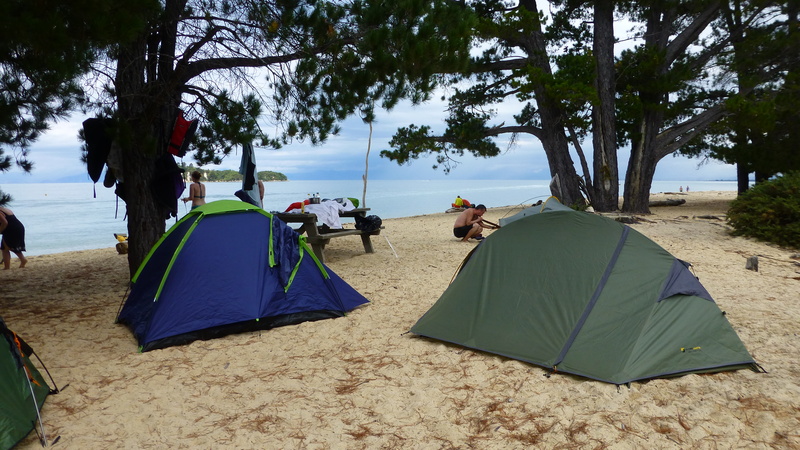 Pitching a tent on the sand is relatively easy. Every so often a peg decides it’s got nothing to hold on to and pops out. With camp set up there was nothing left to do but relax. The ocean shimmered in the afternoon sun. Flashes of white flickering on the green surface. It wouldn’t be long before the sun disappeared behind the hills at our backs. There was only one thing for it, to walk out across the sand and dive right in. Dad made a fuss of how cold it is. After all these years he still hasn’t learned. The rest of us are already quite wet. It’s a rare opportunity to make him feel uncomfortable which Mum and I embraced, chasing him into the sea. There’s a fresh water lagoon behind the beach where we could rinse of the salt. Jason buried bottles of wine in the sand to keep them cool. Lisa started preparing a chilli for dinner. The evening approached. School groups and hikers arrived by boat and by foot, more and more tents popped up along the beach. We ate dinner, scrubbed the dishes clean with the sand and the sea, sending scraps out for the fish. The sound of low waves crashing onto the sand kept us company in the rapidly cooling evening until the wind picked up and we called it a night. Sleeping on sand wasn’t half as good as I expected it to be. I had visions of sinking into a soft mattress that would adjust to my every turn. It seems I had forgotten the days of lying on a beach towel, ever uncomfortable on the shifting grains. 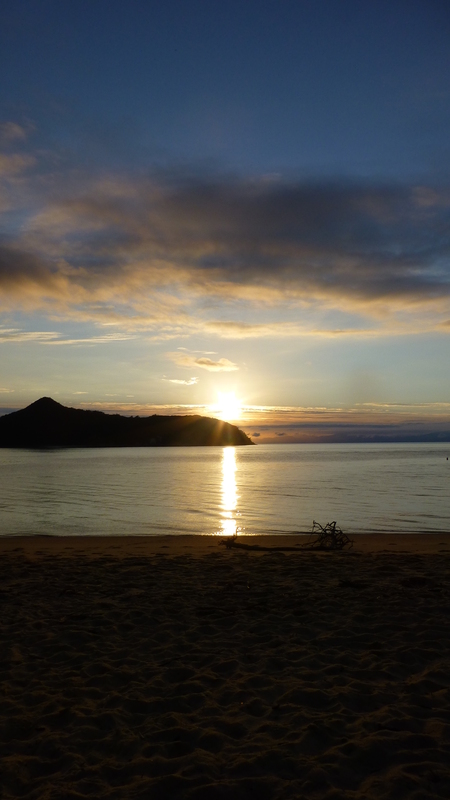 Still, waking up to the sunrise over the islands in the bay made it all the worthwhile. I opened the door of my tent, worried I might have missed it. The sky was clear, pinks and purples shimmered across the clouds on the horizon. While waiting for it to rise, I thought back over the sunrises I’d seen in the last 12 months. Have I seen enough? Definitely not, I never would. 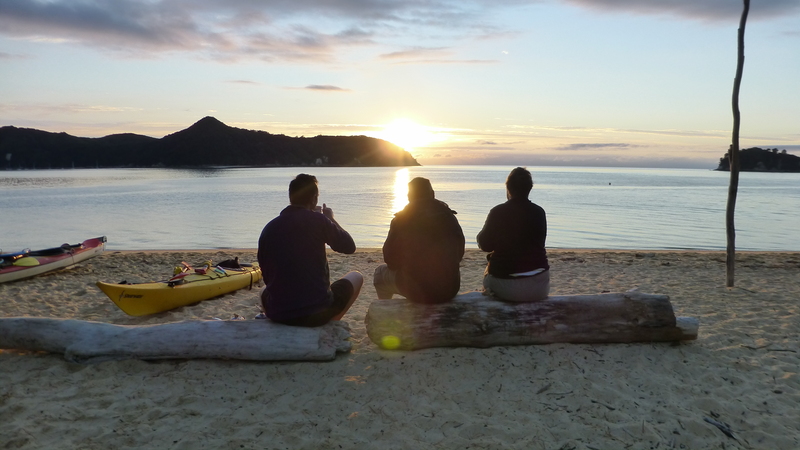 I expected the sun to rise over Adele Island but it came up over the Marlborough Sounds way across the Tasman Bay in between Adele and Fisherman’s Island. It was looked like it was due to be a glorious day. Clouds drew out across the sky from the hills behind us. The sky doesn’t stay blue for long. The sea lingered in the morning sun. Again it was a case of now or never for another quick dip. The water was perfectly clear. Sand dollars nestled in the sand beneath. The night before there was apparently a rather large stingray in the shallows. Lingering on this thought, I found my feet refusing to touch down on the sand below. Just to be safe, you know. The other campers had packed up and cleared off in the early morning while we were swimming. We slowly packed our tents, loaded the boats and got ready to leave ourselves. 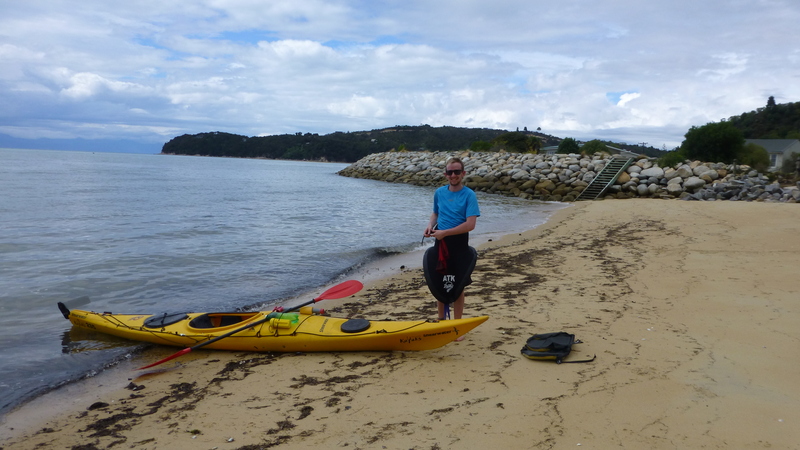 Mum took a spin in the single, seeing how it compared to paddling as a pair. We’re all back on the water soon enough. The surface is calm, the paddling comes easy. We looped back around Adele Island again, watching the seals, cormorants, and gulls sunning themselves. Huge limestone boulders loom in the depths below. It’s not a new sight. I’ve seen rocks in the sea before but the change of perspective, to be this close I find them to be more ominous. Are they deep enough to pass over? More than once I flinched, expecting to hear the scrape of rock on plastic, a massive hole tearing in the hull with water rushing in. Nothing happened. I couldn’t even dip my paddle low enough to touch most of them. A small shoal of fish ripple beneath the surface, breaching into the air above. I wondered if a seal gave chase. We decide to do a lap of Fisherman’s Island on our way back to shore. 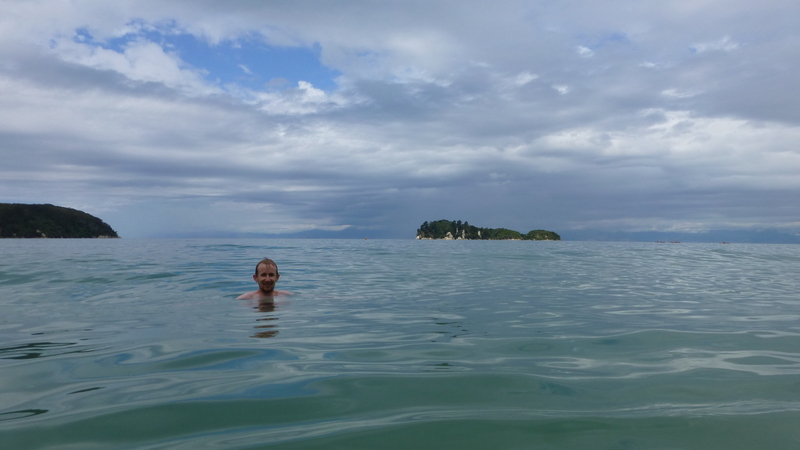 It didn’t look far from Adele Island but it’s open, unsheltered waters between them. 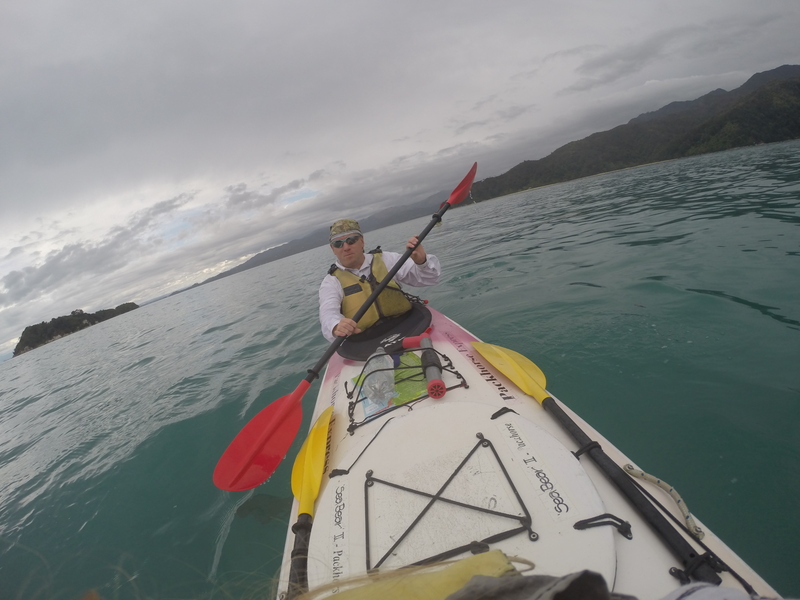 The wind ripped off the bay, it’s hard work paddling against it. I hurry for the waters of the back bay that seemed an eternity away, I found it calm and protected from the wind where I could rest. From here it’s back to base, which seems a lot further away now than it did when we set off. The wind picks up, rising waves come from behind. There’s just enough strength in them to turn the boat. If I can keep my bow straight I’m able to surf a little distance, letting the weather do the hard work for me. I’m relieved that we’ve had calm seas and kind weather. At this rate, I’d struggle in anything much stronger but with a little more experience I suspect it could be a lot of fun. The waves ate away at the distance. Tattered, faded yellow flags signal the landing area. A final push and the boat is up on the beach. We’re finished. The boats are returned, we get showered and hit the road, heading towards Picton for a ferry to the North Island. You’re welcome! Thanks for joining me.